Some things are deeply personal, and that makes them hard to dislike. 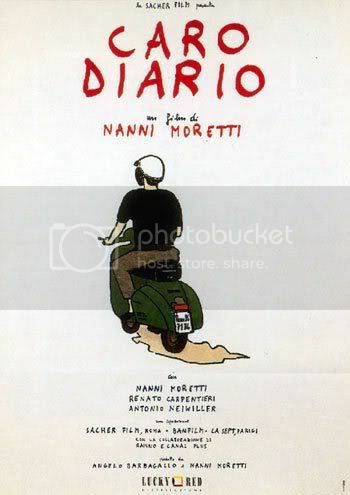 The first "episode" in Nanni Moretti's charming, rambling, autobiographical Caro Diario (Dear Diary) disarmed us completely since it could have been written by the PPCC ourselves - word for word, thought for thought. We too have spent many hours riding our motorino around the Monteverde and Garbatella neighborhoods in Rome, gazing enchanted at the neighborhoods we passed. There's something magical about other people's homes, or maybe we're just a little voyeuristic. But, like Nanni Moretti says, we just love to look at homes. Particularly, in those neighborhoods. Particularly, when flying by on a scooter. 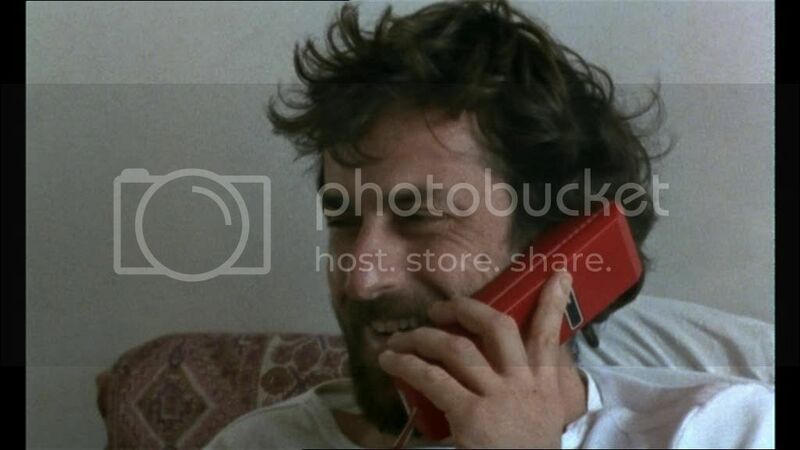 When we started recognizing in the film that one road which leads up the Janiculum, or that one piazza in Garbatella, and when Moretti started vocalizing the exact same thoughts we used to have ("I wonder what it's like to live there. I could just watch apartment blocks pass forever.") we were bought and sold. Nanni - man - you're speakin' to us! You're speakin' our language! But worry not - this whimsical, enjoyable little film is a treat for everyone. Moretti's stream of consciousness voice-over is quirky and refreshing in a universal way. If you've never been to Italy, never watched a Nanni Moretti film before, and don't care for apartment-gazing or mopeds, that's fine. Although our recognition felt nice, it wasn't necessary - the movie was nice enough by itself. On the way to one of the crazy Odyssean islands. With the easygoing charisma and low-key narcissism that is Moretti's trademark film persona, this film takes us through three seemingly unrelated episodes. In the first, In Vespa, we follow him as he rides his Vespa around Rome's deserted streets during Ferragosto (the August holidays, when Italians flee the cities). He muses on neighborhoods, pretentious films and his secret desire to dance ("It was the movie Flashdance that changed my life."). In the second episode, Isole ("Islands"), he travels with his TV-phobic/TV-philic friend Gerardo (Renato Carpentieri) around the Italian islands - each characterized by an almost mythical weirdness (one island's inhabitants are ruled by their children). And in the final episode, Medici ("Doctors"), Moretti deals with a mysterious dermatological illness which plagues him and confounds doctors. The film is airy and unconcerned, yet it feels meaningful and suggestive. For something of an ego project (something Moretti's critics never tire of pointing out is how indulgent his films can be), it's also quite astute. You're never bored - quite the opposite, Moretti is a relaxing, fun companion. In fact, as overconfident and in love with himself as he is, he's not above teasing himself or pointing out his flaws either. One of our favorite moments is when he watches an overly intellectual Italian film in which one of the characters laments the fact that, in youth, "we all yelled terrible, violent things, and now we've aged complacently and turned ugly." A fed-up Moretti responds later, "You yelled terrible, violent things and you have becom ugly. I yelled the right things, and now... I'm a dashing 40-year-old!" And just when you think Moretti has gone a little deluded with self-love, in a later scene, he spots Jennifer Beals - the star of Flashdance - and has no qualms letting himself turn into a laughably starstruck fan (Beals thinks he's a foot-fetishist and treats him like an asylum escapee). 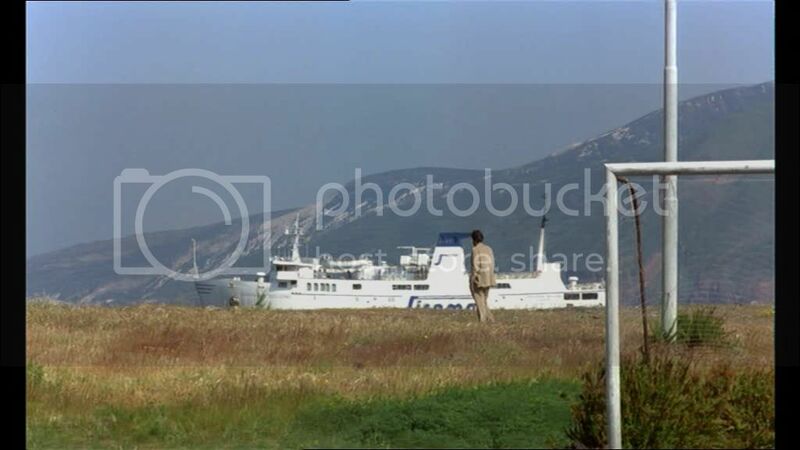 Moretti favors his usual filmmaking style: lots of shots from behind, and some playfulness with perspective, such as this scene when he ambles along with an incoming yacht. A mix of fact and fiction: the scenes which deal with Moretti's experience with cancer as autobiographical, and here he even uses real footage of his final chemotherapy session. Wikipedia calls Moretti the "Italian Woody Allen", and there's some truth to that. Both actor-directors make "happy intelligentsia" films which are full of frothy intellectual musings and cunning analytical tricks. 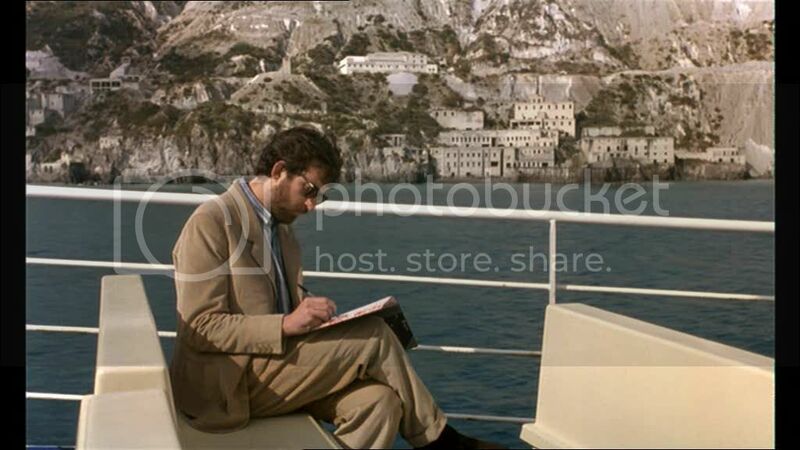 In one scene in Caro Diario, Moretti - overcome by his apartment-love - buzzes himself into an apartment by pretending to scout for locations for his next movie. "What's the movie about?" one of the residents ask. "It's uh... about a Trotskyist sweet-seller in the 1950s," Moretti fumbles. Then he smiles: "It's a musical." 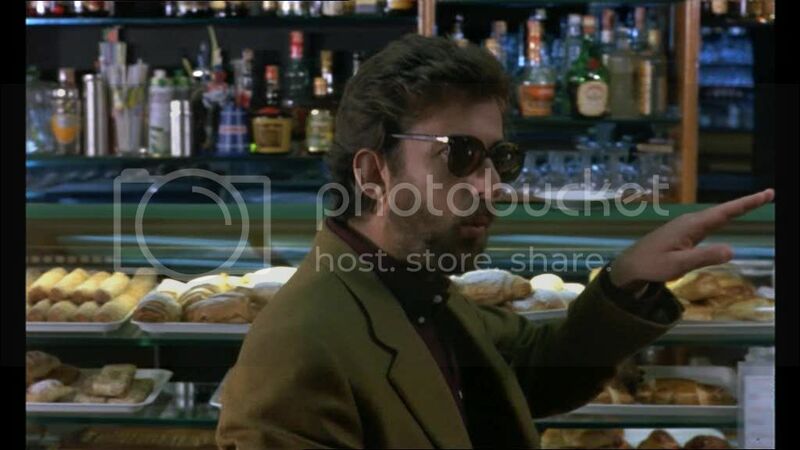 Much later in the film, Moretti walks into a sweetshop/bar and sees a 1950s musical on the television. Smiling helplessly, he begins to dance along. It's a smart little bookend to the earlier scene, and something we almost didn't notice until we thought, "Hey, it's the Trotskyist sweets musical!" There are lots of other notes of low-key intellectual playfulness, such as the constant allusions to Ulysses (both Homer's and James Joyce's) during the Isole episode, and all the islands' surreal jokes (such as "the constant menace of the volcano" on Stromboli making everyone, including Moretti and his friend Gerardo, angry and inhospitable). There's no narrative or message - the film is just a rambling trip into a variety of places and ideas, with a strong sense of silliness and surreal satire. We highly recommend this and Moretti's Palm d'Or-winning hit, The Son's Room. Be warned of the differences in tone between the two movies, though - this being whimsical, easy and lightly politicized, while The Son's Room is devastating and completely apolitical - but both are excellent films.